There were no empty seats at Winchelsea New Hall on January 19 for a talk by Tom Hart Dyke, giving the Winchelsea Garden Society 2019 Winter Lecture, entitled “From captivity to a castle”. Tom’s story is well known. Kidnapped 20 years ago while plant hunting in central America, and living under constant threat of death, he dreamed of creating a world garden as a way of keeping sane. Unexpectedly set free after nine months – he jokes that his captors could no longer cope with his continuous talking – Tom returned to the family home at Lullingstone Castle in Kent and set about transforming a one-acre walled garden into the garden of his dreams. Distorting the map to fit the plants he has collected – his Tasmania is not much smaller than his Australia and his Canary Isles, consolidated into one, almost make a continent in themselves – Tom has managed to cram a vast amount into a small space. New polytunnels and greenhouses have expanded the scope for a collection of succulents and many other choice plants. 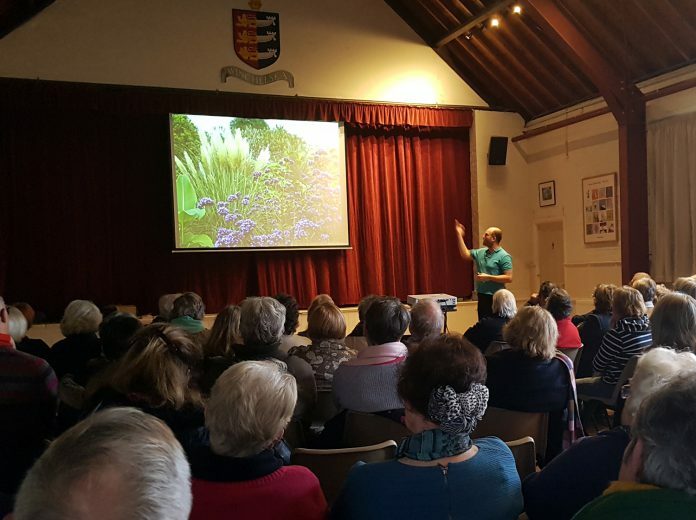 Tom talked about the madness of trying to garden in one of the coldest valleys in Kent and about the devastation caused by the frost, snow and freezing wind of last year’s “beast from the East”, but he also gave testimony to the resilience of plants that seemed dead and yet amazingly revived. It was a roller-coaster of a story, told with great panache and enjoyed by everyone who heard it. The next Garden Society event will be the Spring Show at Winchelsea New Hall on the afternoon of Saturday April 13.